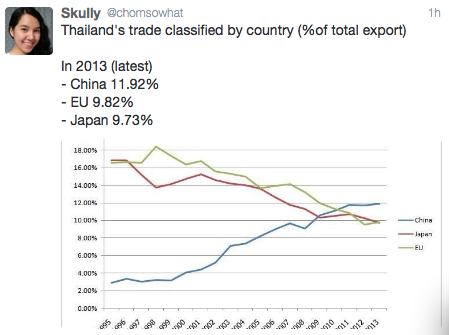 Today @chomsowhat posted some very interesting charts and statistics on twitter, showing foreign investment in Thailand and the top 3 countries for exports. Of course the purchasing power of China has been increasing dramatically across the globe, China becoming the number one country for export is no surprise. Exports to Japan being almost even with exports to the entire EU was a bit surprising. 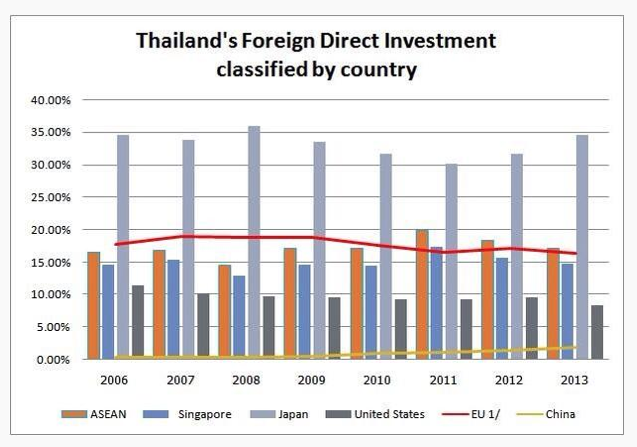 Japan has long been the biggest investor in Thailand, think about the automotive sector, and Japan’s level of investment has remained consistent and is rising from a few years ago. The United States and EU have seen the level of investment falling over the past few year, while China’s investment remains very low. Interesting to see the United States as a significant investor, but the Unites States is not a top destination for exports. The media have detailed the new government in Thailand is very close with China, the export numbers and potential for China to invest in new rail networks throughout Thailand provide support for discussions that ties between China and Thailand are very strong and will continue to grow.